It is now a legal requirement for all properties (except listed buildings) marketed for sale or let to have an Energy Performance Certificate (EPC). 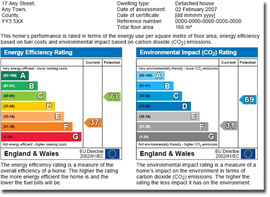 The aim is to help improve the energy efficiency of buildings and the certificate provides ‘A’ to ‘G’ ratings for the building, with ‘A’ being the most energy efficient and ‘G’ being the least, with the average up to now being ‘D’. Accredited energy assessors produce EPCs alongside an associated report which suggests improvements to make a building more energy efficient. Visit the government’s energy performance certificate website for more information. We provide Energy Performance Certificate from an excellent local provider. Your EPC will be produced normally within 3 working days and will be made available in electronic format to minimise delay and be more environmentally friendly. Contact Godwin Curtis for details.